Welcome back. 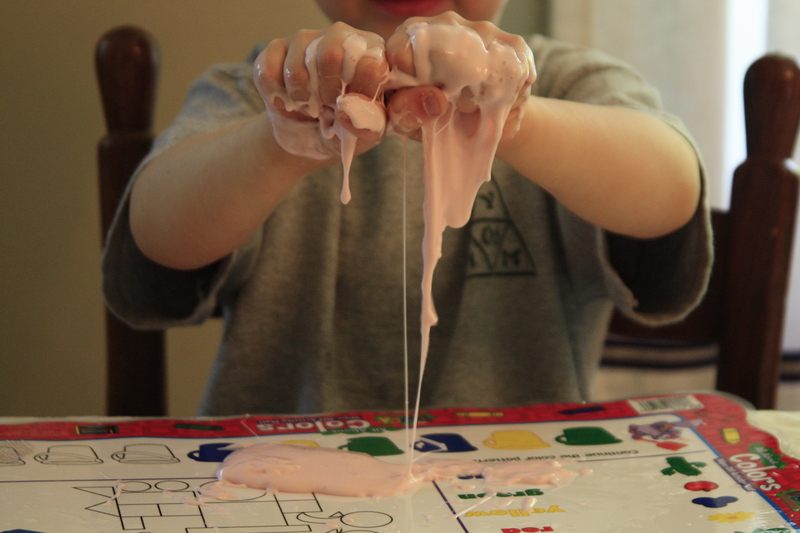 Today we’re making fresh homemade slime. Today’s activity is all about tactile fun. The kids choose the colors and help with mixing. It’s like making play dough but slightly more fun. The final polymer should be mostly a solid, though a very stretchy one. If it’s too wet, try adding a little more Borax. If it’s too firm and won’t stretch…. maybe you’ve made flubber. Try bouncing it around in the shower stall. 1. Pour about 1/3 cup glue and 1/3 water into a cup. Stir together and add the dye. In a separate cup or clean plastic bottle with a lid, stir (or shake) about 1 Tablespoon Borax with about 3/4 cup water. Mix very well. 2. 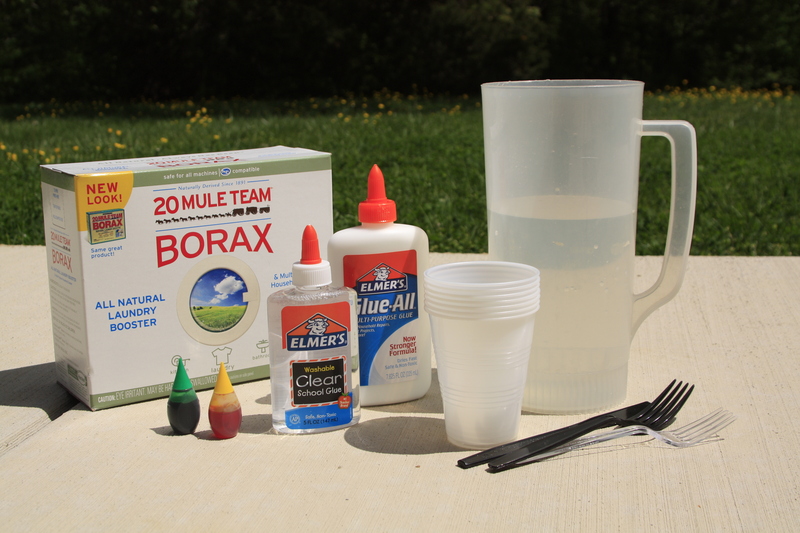 While stirring, pour a few drops of the Borax solution into the glue mix. Stir well, Continue adding Borax in small amounts until you have mostly glop and very little liquid. Pour off liquid and rinse the slime. It’s ready to play with! Store in a plastic bag or jar. 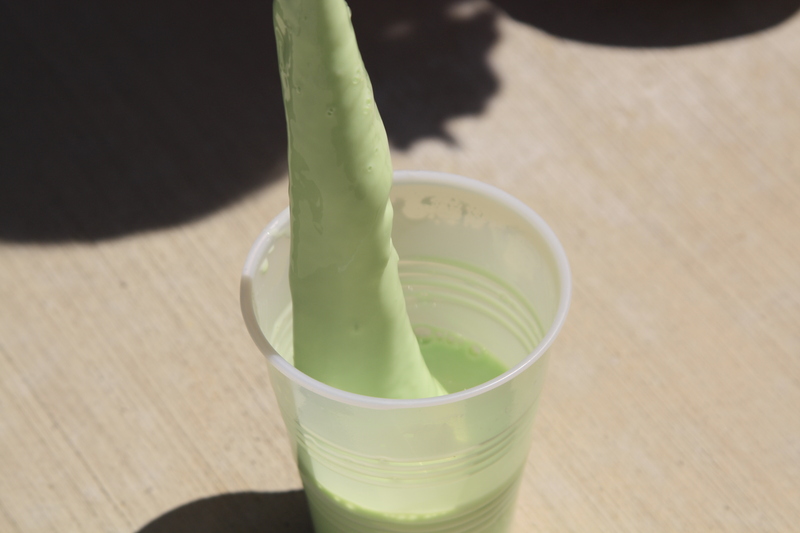 If you would like to see slime being made, this is a good video tutorial. There are ways to make it without Borax, too. Just search for it on Youtube. This entry was posted in Science Fridays and tagged acitivities for kids, fun, gak, preschool science, science, slime, summer fun by Maren. Bookmark the permalink.